Former fast food empire is down to just two stores, but loyalists are trying to keep the concept alive. On May 3, the fast food restaurant Beef Burger in Greensboro, North Carolina, celebrated its 50th anniversary by offering customers burgers for 50 cents. Staying in business for half a century is a big accomplishment for any restaurant, but it is particularly impressive for this eatery, which is one of only two remaining stores in a largely forgotten fast food empire called Biff-Burger. Biff-Burger was founded by brothers Bruce and Earl Brane in 1956, just as McDonald’s and Burger King were laying the groundwork to eventually dominate the American burger market. The Brane brothers’ first store opened in Clearwater, Florida, near the town of Largo, where they built broilers in their manufacturing warehouse. In the 20 years following the company’s founding, the Branes opened scores of Biff locations from Florida to Canada — at least 127, says Biff historian Christopher Catherman, but possibly hundreds more. Catherman, a geologist at a private geotechnical engineering firm near Camp Hill, Pennsylvania, has taken it upon himself to piece together the history of Biff-Burger on his website, biff-burger.com. He launched the website when his local Biff closed its doors in 2001, leaving just the Greensboro store and another in St. Petersburg, Florida. “I can remember as a kid during the 1970s, before McDonald’s, Burger King, and Wendy's came into town, there stood an interesting little multicolored burger joint named Biff-Burger - which was as popular and nostalgic as an old diner,” Catherman wrote in a tribute at the time. In the 10 years since his local Biff closed, Catherman has documented the existence of 120 former U.S. locations in 14 states, as well as seven in Canada. 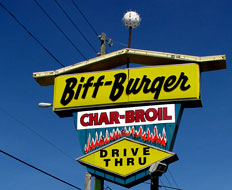 He’s also substantially beefed up biff-burger.com, including in-depth detail on Biff’s two culinary signatures, the Roto-Broiler and Biff’s Secret Sauce, which he says largely accounted for Biff-Burger’s success. As for the company’s eventual failure, Catherman says it remains mostly a mystery. He’s done his best to chronicle Biff-Burger’s demise, poring through the company’s franchise booklet and piecing together information from customers who contact him through his website to share their memories of the chain. Catherman says the Mary Carter Paint Company, which allegedly owned National Biff-Burger System Inc., was sold to Resorts International for $9.9 million in 1968. Catherman’s theory is that Resorts International was more interested in gambling than burger flipping and, in 1976, when New Jersey legalized gambling, it washed its hand of Biff-Burger and tried its luck at casinos. The story is hard to follow, the facts uncertain. What is clear, however, is that National Biff-Burger System Inc. went belly-up in the mid ’70s, leaving its former franchisees to fend for themselves. Eventually, all the Biffs closed except for two. The St. Petersburg location is the only former Biff franchise with its original name, which, Catherman says, stands for “Best in Fast Food”, Opened in 1958, it operates out of its original building and uses original recipes. “We’re still here, alive and kicking,” general manager Troy Musser says. The restaurant regularly hosts classic car rallies and generally thrives on the flashback appeal embodied by its five-decade old home, he says. In the 20 years following the company's founding, the Branes opened at least 127 Biff locations from Florida to Canada. Up in Greensboro, Havis is similarly committed to carrying on the Biff legacy. While he changed the name to Beef Burger to avoid potential lawsuits after the company collapsed, he proudly abides by just about everything else Biff-Burger stood for. Havis, 68, runs the restaurant with his wife, whom he met in 1962 at the restaurant. It’s a big part of his attachment to the store. Havis hasn’t groomed anyone to take over the restaurant when he does walk away-voluntarily or otherwise-and he’s not sure what will happen to the place when he’s no longer around to mind the broiler. “If something ever happens to me, they’ll probably come in and bulldoze it,” he says. That would leave one known Biff-Burger in the U.S., but it would not necessarily be the end of the story. So while Biff-Burger may never regain its place among the country’s iconic burger chains, the Roto-Broiler, it seems, is still turning. Copyright © 2011 Journalistic Inc. All rights reserved.